I wouldn’t want you to think that I’ve sold out to the corporate world in my advancing years, but the eagle-eyed among you can’t have failed to notice how much time I’m currently spending in chain restaurants. 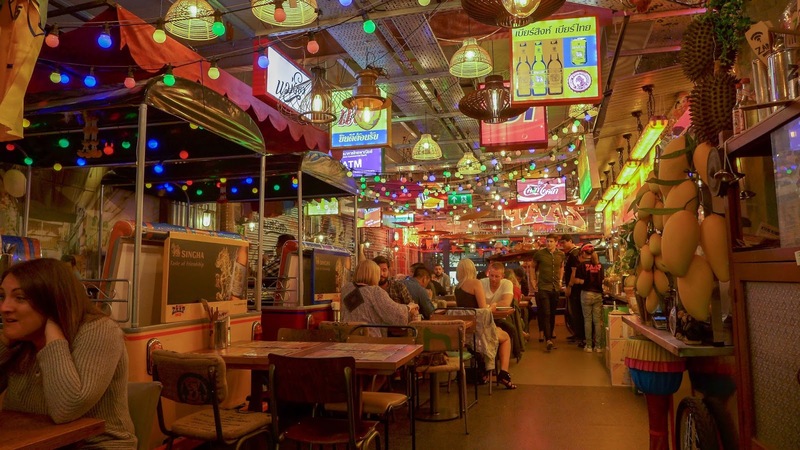 The thing is, judging by the thrum and buzz that has been evident when I’ve visited so many of the newly opened multis in and around Newcastle, so are lots of you. 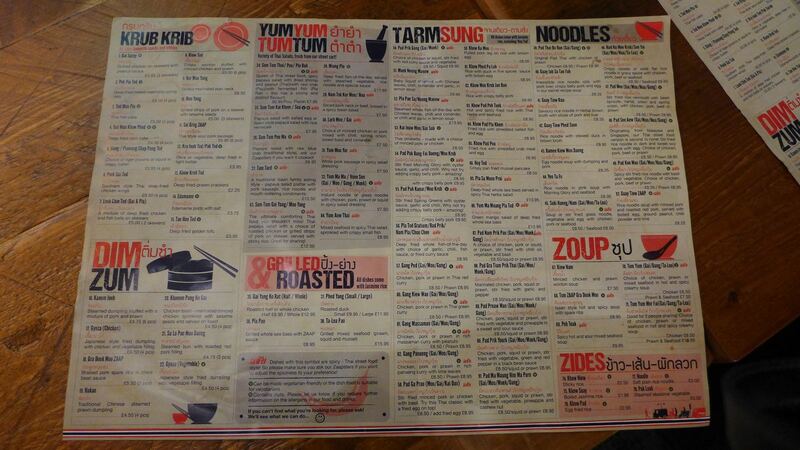 And, so long as we’re all going to eat in these gaffs, why not try to suss out the better venues from the also-rans? Chain restaurants are springing up everywhere. Mrs Diner and I have happened upon so many packed houses, we’ve started to wonder how many more mid-range food brands Newcastle can shoulder. We’ll find out soon enough as the refurbishment of Eldon Square continues apace, with some 20 units to be shared among a host of mostly familiar names. Sure, I’d rather focus on independents, but as investors have put an awful lot of cash into our region’s restaurant scene, it’s only right that I give them all the once-over. We have been impressed by a few (Byron, Turtle Bay) while left very cold by several others (including Thaikhun and Cabana). 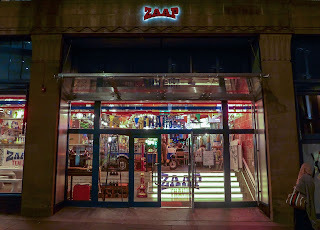 In which category would I place Zaap, a Thai outfit that completes the chain gang alongside Turtle Bay and Cabana in the old Co-Op building? As we stood waiting for a table, we took in the scene. Once we got to our table we continued to take in the scene. There was plenty of scene to take in. This seems to be rule number 1 in the book of “how to open a chain restaurant”: fill it with stuff until it’s bursting at the seams, then pack in just a bit more stuff. People like stuff, right? The space that I think was once the wine aisle of the old Co-Op is now home to tuk-tuks (obviously – it’s a Thai place), battalions of waving-hand cats, a mid-range marketing budget’s worth of adverts for Thai brands and, just for good measure, the whole front end of a bus, which – larks! - you can sit inside. The lighting is - how shall I put it? - busy. So is the music. High above our table were stashed massive crates of biscuits. Why? Will these ever be eaten? I decided it was better not to ask, snared us some of the free help-yourself popcorn and turned to my menu. This is 2016, so of course we were treated to some spiel about how, by the mere act of sitting down in their restaurant, we were about to join a Street Food Revolution. I looked around me and completely failed to spot anything that looked very revolutionary. Repeat after me: you don’t get street food in restaurants. Ever. 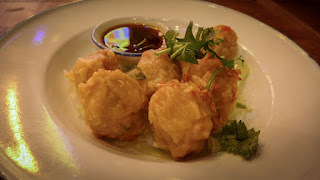 I had great street food on the Quayside last week. I had great street food in the Grainger Market. 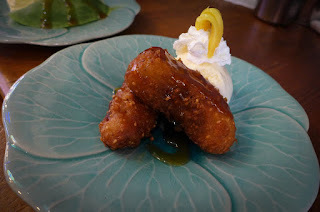 You can read both of my reviews on this site -- but this is restaurant food, not street food. Fullstop. 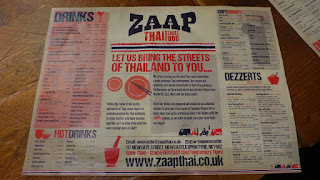 What we did get to kick us off in Zaap were some good deep-fried standards. 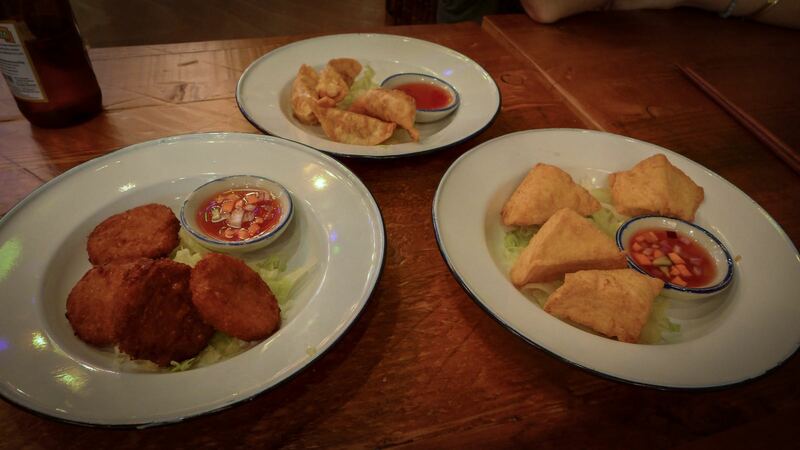 Tofu was outwardly crisp and inwardly squishy, corn cakes had good flavour due to being well seasoned and some not-exactly-Thai-but-who-cares gyoza were on the money. 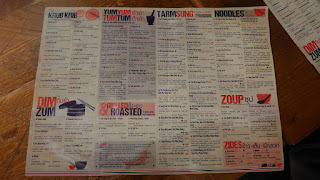 All of the above were served with rather gloopy sauces which could have done with some additional pep or tang. Best of the starters were some slippery but toothsome steamed dumplings of prawn and pork with a soy-based sauce. 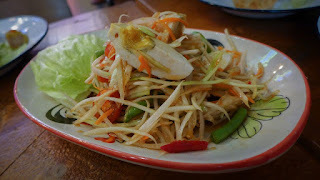 Anywhere claiming to do Thai food has to be capable of turning out a good papaya salad, and Zaap passed this test quite admirably. We were joined by a vegetarian friend from Brighton (where everyone is vegetarian, I think); I’m not sure what they used instead of fish sauce to give the thing its depth and funk, but it worked a treat. Spice from scud thai chillis was balanced out with sweetness, the tang of lime and a salted boiled egg to make for an addictively good dish. A mix-up over our mains nearly led to outright disaster, as my pork red curry (above) was initially plonked down in front of the veggie pal. I can see how they got it confused with her vegetable Panang curry (above) - the sauces looked and tasted similar. 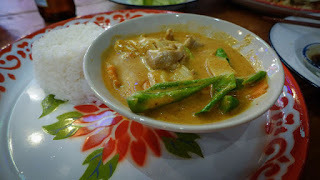 Happily, it was a good sauce, rich with coconut and humming with spice, although there was none of the characteristic peanut flavour to the “Panang” version. 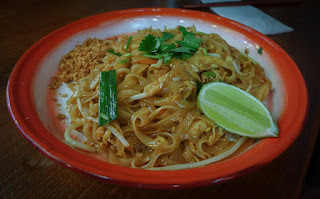 Mrs Diner road-tested the pad thai, which was a technically sound version of the classic noodle dish, given texture and interest by the roasted peanuts on the side. Puddings were fun. 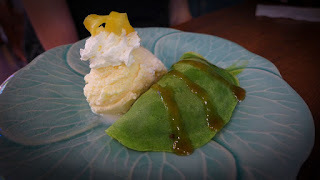 An eerily green pandan pancake obscured some similarly-hued custard. A deep fried wodge of banana gave the meal a sense of symmetry. I was sufficiently charmed by the description of Bua loy kai wan as “silky little dumpling in sweet, warm coconut broth” to place an order, adding in the optional poached egg on the basis that you only live once. 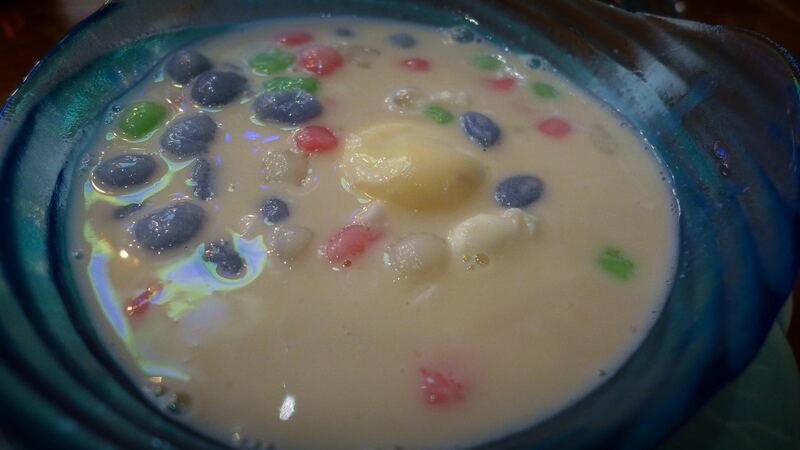 The latter was sadly boiled to puck-like consistency and so added little in the way of pleasure, but the rice flour dumplings had an oddly addictive texture to them. Service, other than placing a bowl of pork in front of a vegetarian, was engaged and warm. I enjoyed a bottle of Beerlao which, being brewed from rice as well as barley, has a nice clean taste to it. 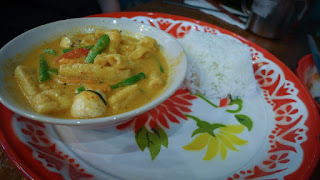 The meal for three of us came to a shade over seventy pounds, which is considerably less per capita than we have spent recently for much poorer food at both Cabana and Thaikhun. In the final analysis, Zaap is a keeper. This is partly because, as I’ve mentioned before, Newcastle is hardly awash with good Thai food (see all the others here). It’s also partly because they’re turning out sturdy renditions of Thai dishes at reasonable prices. And because, for reasons I can’t quite put my finger on, I found the madness of their interior decoration more funny than annoying. It may have something to do with the free popcorn. I do like popcorn. I promise I’ll continue to focus those valiant independents that give the region’s food scene its character in coming weeks. 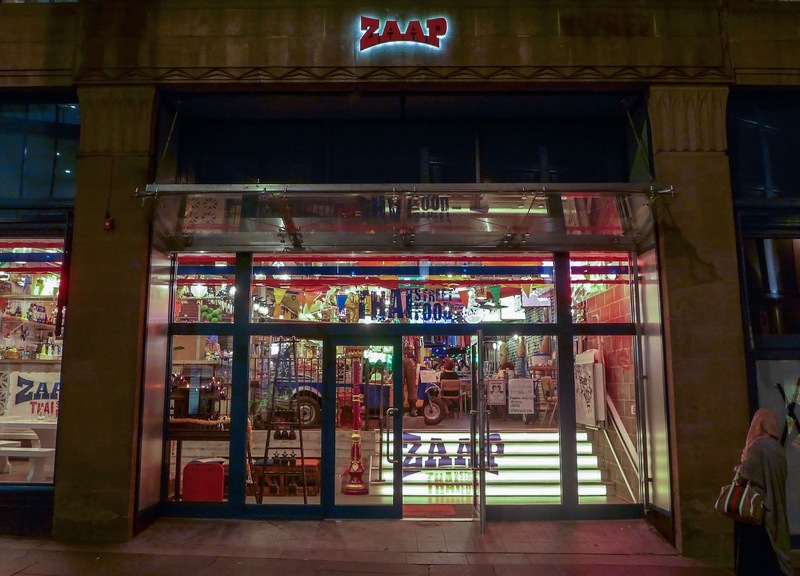 But if in the meantime you find yourself in town with a hankering for reliably prepared Thai standards, Zaap is well worth a look. Having lived for years in Thailand Thai House Cafe is the most authentic amazing food I've had outside of Thailand. A must visit. 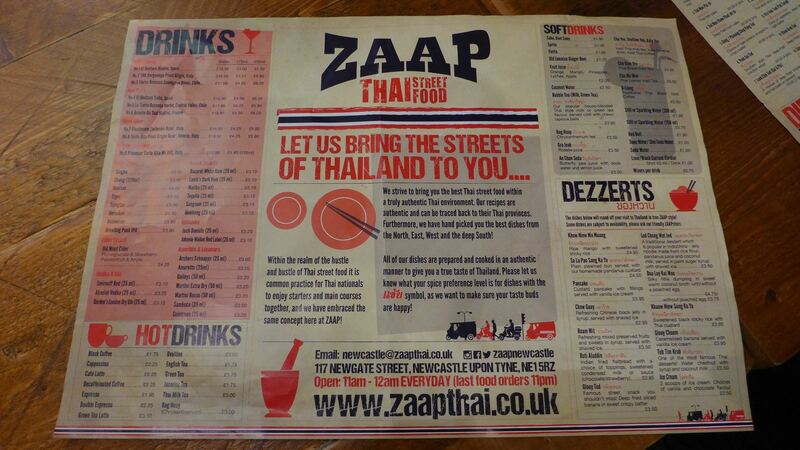 Didn't rate Zaap at all.